Chaplain, I am a strong believer in Prayer. There are three ways that men get what they want; by planning, by working, and by Praying. Any great military operation takes careful planning, or thinking. Then you must have well-trained troops to carry it out: that’s working. But between the plan and the operation there is always an unknown. That unknown spells defeat or victory, success or failure. It is the reaction of the actors to the ordeal when it actually comes. Some people call that getting the breaks; I call it God. God has His part, or margin in everything, That’s where prayer comes in. Up to now, in the Third Army, God has been very good to us. We have never retreated; we have suffered no defeats, no famine, no epidemics. This is because a lot of people back home are praying for us. We were lucky in Africa, in Sicily, and in Italy. Simply because people prayed. But we have to pray for ourselves, too. A good soldier is not made merely by making him think and work. There is something in every soldier that goes deeper than thinking or working–it’s his “guts.” It is something that he has built in there: it is a world of truth and power that is higher than himself. Great living is not all output of thought and work. A man has to have intake as well. I don’t know what you it, but I call it Religion, Prayer, or God. Mother Margaret Georgina Patton first came to the Abbey in the early 1970’s while a freshman at Bennington College amidst the social turmoil surrounding the Vietnam War. She was personally implicated in the conflict through her father George S. Patton’s distinguished service during three tours of duty, one as colonel, commanding the 11th Blackhorse Armored Cavalry Regiment. In conversations with our Foundress Lady Abbess Benedict, she discovered that her grandfather General George S. Patton Jr. and the American 3rd Army had liberated the Abbey of Notre Dame de Jouarre from Nazi occupation during World War II. Mother Benedict, an American who had entered Jouarre in 1936, had the inspiration to found a monastery in the United States in response to what she described as the “lifting of oppression” by the American soldiers on the day Jouarre was liberated. As Mother Margaret Georgina became drawn to monastic life at Regina Laudis she could begin to claim the rich genealogy of her military family. She completed her B.A. in English at Dartmouth College in 1976, and entered Regina Laudis in 1982 . Go here to read the rest. General Patton never underestimated the power of prayer. I think he would have saluted the decision of his granddaughter to dedicate her life to prayer and been gratified that his Third Army set in motion the events that led her to that life. Be obedient, charitable, meek and humble toward each other. Saint Franca Visalta’s admonition to her nuns on her deathbed. 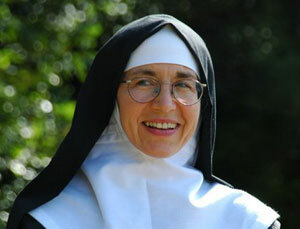 I am elated to see this piece about Mother Margaret! I am the daughter of a Holocaust survivor and had a profound interaction with this beautiful Religious a number of years back. On a beautiful visit and retreat to the Abbey, we were assigned a time period to help Mother weed out rocks from a potato field. About 40 minutes into the task, the heat was getting to me between the uncomfortable posture on the ground and the constant walking across the field. At one point, while walking my next batch of rocks across the sweltering field to one of the huge wheel barrows, the thought crossed my mind that when my mother was in Auschwitz and Bergen Belsen, she, like so many others, had to carry not only rocks, but dead bodies in all kinds of heat and cold and place them in the trucks. With “a gun to their heads”. The imagery helped me put my personal struggle with this task in total perspective. And then suddenly it hit me. Oh my gosh. Here I am, the daughter of a Concentration Camp Survivor sharing in a task with PATTON’S GRANDAUGHTER that not only unexectedly conjured up Holocaust imagery in order to sustain myself; it occurred to me that the odds of this were so remote and that unlike the horror of my mother’s experience, Patton’s grandaughter and I were doing something together that was beautiful, prayerful, and holy. During our labour, Mother hadn’t known about my background. When our work was over and we all sat on the ground resting as Mother gave us an ice cold drink of delcious homemade lemonade, I choked up and revealed the connection of our backgrounds and the very different circumstances we were in. “Because of your grandfather, I am here with you in this field.” At the end of our visit at the Abbey, Mother gave me a gift in a box to remember her and our experience together. When I later opened it, I welled up because it was rock taken from the wheel barrow with a hand painted note on it from Mother. Though I now can’t recall the words (and must find the “safe place” where I have placed my gift), it was a message that spoke to the transformative power of our joint experience. Mother and I were both very moved by God’s hand in all of this and I will always cherish that memory. She and all the women at the Abbey are brilliant, strong and beautiful! Including Mother Delores Hart who was the beauty who played opposite Elvis Presley in “Where the Boys Are” and other films. What a beautiful story Peggy! My father, who I’ve mentioned told me many unbelievable stories of his experiences and those of others in World War II, often said that the reason that we won at Midway when it looked for all the world like we’re going to lose the war, was because we prayed..and prayed and everyone prayed, even the ‘non-believers’. I’ve often thought of that. Just as with Don Maclary accounts of the Civil War: Someone, something much greater was at work. What an wonderful, inspiring story connecting General George Patton 70 years ago to today’s Mother Margaret and her dedication to making a difference in our world. The importance of our own prayer and making a positive difference comes through quite clearly.